We’d love your help. Let us know what’s wrong with this preview of Stuck by Stacey D. Atkinson. Odette Leblanc is promoted to night-shift supervisor at the local convenience store, but at the age of twenty-three, she already feels like her life has become a predictable routine. That is, until she meets a mysterious doryman and his cat on the beach, followed by an unexpected run-in with an American sailor. Each man will undeniably change the course of her life, and so Odette Leblanc is promoted to night-shift supervisor at the local convenience store, but at the age of twenty-three, she already feels like her life has become a predictable routine. That is, until she meets a mysterious doryman and his cat on the beach, followed by an unexpected run-in with an American sailor. Each man will undeniably change the course of her life, and so will the selfish actions of her bingo-addicted mother, an impressionable younger sister, and a team of damaged co-workers. Their stories weave together only to unravel in a mess of lies, betrayal, and missed opportunity that will leave Odette to face an uncertain future. Set in the picturesque Acadian fishing village of Pointe-du-Chêne, New Brunswick (Canada), Stuck is an emotional journey about redefining what’s important in life and staying true to yourself. Atkinson takes off from page one with a hard hitting look at life when life isn’t perfect. She makes her story inviting, without pulling any punches. This was a well written, quick read that was quite enjoyable and easy to follow. Atkinson’s smooth, approachable writing style draws you in, allowing you to focus on the story at hand. Her no holds barred storyline is paired with allusion and brilliant description to create something truly remarkable. The story is dripping with history and culture, Atkinson takes off from page one with a hard hitting look at life when life isn’t perfect. She makes her story inviting, without pulling any punches. This was a well written, quick read that was quite enjoyable and easy to follow. Atkinson’s smooth, approachable writing style draws you in, allowing you to focus on the story at hand. Her no holds barred storyline is paired with allusion and brilliant description to create something truly remarkable. The story is dripping with history and culture, drawing you in to the Acadian coast. Atkinson gives flashbacks into the main character’s past, allowing you to see how she came to be who she is today. It was so easy to get into as the main character appeared to be telling her story to the audience. You really feel for her. You get to know this community as a whole through their interactions with the main character. I appreciate how everyone was so down to earth and natural. I felt like I really was in a fishing village. I also love the dialogue in this novel. It’s so natural & flows the way real people talk. The mix of French and English, which is so common to the region in question, is easy to follow, even if you don’t speak French. I loved this story. It was a remarkable portrayal of life in Acadia. I appreciated how this was a very Canadian novel without being only that. Above all, it was a story about surviving and being yourself. I’d definitely recommend picking up a copy. Odette is stuck. Stuck in a dead-end job. Stuck living with her unemployed, BINGO addict mother. Stuck paying the bills and being responsible when she should be experiencing life. Odette decides it’s time for her to venture out of her comfort zone after spending time over the summer with Henri, a wealthy sailor who is vacationing in her hometown on his yacht, and Ben, a doryman awaiting his next research assignment. Gah! This book was awful. I hate giving bad reviews, but I would feel worse if I sugarcoated a book and other people read it because I didn’t tell the truth. There was just no depth to this story at all. The characters were weak, the dialogue almost non-existent, the romance (if you could even call it that) inappreciable. My opinion – don’t waste your time. I had read a strong review for Stacy Atkinson’s book online, which led me to buying the ebook. It was a very nice discovery to Stuck, and get into the mind of Odette – her 20 something heroine. At first, I truly felt stuck in Odette’s world. There were friends and family who gave me a laugh or caused some reflection (Odette’s best friend is about move across Canada, which makes me think about all the times I’ve moved away from great friends), and yet the clever repetition of nights working for the town convenience store truly put me into Odette’s world of being stuck. The repetitive ring of the door when customers entered was brilliant. My relief came with Odette’s relief as she slips away to the coastline a bit at a time. It becomes so clear early on that this is what will save her, even before the romances being to spark with mystery adventurers and wealthy yacht-sailing millionaires. This book is a great contemporary read. I like the slow awakening within Odette to resist being so totally stuck, and I like how it’s not her roots and culture that keep her stuck but rather her own mindsets and inhibitions. The Acadian setting is wonderful and the mixture of French and English is fantastic – wisps of French drop into the conversation of English and no explanation is required. Stuck is a visit to the ocean’s coast, a long taste of Easter Canada. I wanted to find Odette on that beach and be there with her, and cheer her forward with each inkling of change. Atkinson carried me along the wave of Odette’s personal journey, and had me invested in her adventure. To me, that’s a darn tootin good book. Beautifully done. Stuck is in a way a coming-of-age tale that puts you into the mind of the MC, Odette. This poor girl feels she’s stuck in her current circumstances without a way out. There’s no real threat or issue keeping Odette where she is other than her lack of self-confidence. I call BS on that, though, because she’s only as stuck as she wants to be. Atkinson introduces us to Odette through a daily play-by-play of her life, the town she lives in, and those who influence her most. The secondary characters aren’t as important as they could be, but a few play an important role in Odette’s life. She has a younger sister at home and a worthless mother she supports with a dead end job. At 23 years old, I’m a bit ashamed of Odette’s stance in life. Also, the repetitiveness of Odette’s day puts you in her head more than you want to be. It’s almost too much and doesn’t allow for much sympathy for Odette’s plight. She starts off as an insecure liar and develops into a self-assured bender of the truth. I say that because she doesn’t accept a few things she should as truth and tries to make herself feel better by creating her own truth. While the book doesn’t boast a traditional love triangle, there are two men who come into Odette’s life and make her look at things through a magnifying glass. Henri is a great character. He’s sweet, seems genuine, and truly likes Odette for who he believes she is. Of course, if she hadn’t lied about herself upon first meeting him, I think he would have liked her even more. Being truthful is such a huge deal when building new relationships. Odette doesn’t know this because of her lack of experience with boyfriends, living a deceitful life, and her loud and often incorrect, best friend Sarah who gives the most awful advice. Sarah definitely deserves the ‘worst BFF ever’ award. I wouldn’t listen to a word that girl says. Now, Ben … what can I say about him? He’s an enigma and remains one since we don’t learn much about him. But he has the most pull on Odette, even though she doesn’t answer the call. Ben is similar to Odette in that he doesn’t have much in life and doesn’t worry about living beyond the here and now. He’s so down to earth and is what Odette needs to keep her grounded. Odette falls into the trap of wanting to be more than she is because of who she hangs out with. I think the author does a great job of showing us how clueless Odette is to her own feelings by putting her in the sight of both men. The setting of the quaint fishing village is beautiful. You can smell the ocean air, hear the seagulls near the boardwalk, and feel the bright sunshine on your skin while reading. I don’t know much about lobster fishing but feel like I’ve learned quite a bit with Stuck. It also doesn’t hurt that Odette takes to sailing like a fish to water and it becomes her new obsession. With that occurrence, she begins to see there is more to life than working a dead end job, providing for people who don’t care about you, and not living your dreams. The issues between Odette and her mom need to be addressed. Atkinson does not do a good job of conveying Odette’s feelings to her mother. Too much is left unsaid or up to interpretation. Her mother doesn’t take anything Odette says seriously nor does she care how much she’s hurt her. Then there’s Odette’s younger sister who is on a collision course with life-ruining circumstances. The talk Odette needs to have with her sister never happens, and the author missing the chance to send her your readers a positive message is a (huge) disappointment. 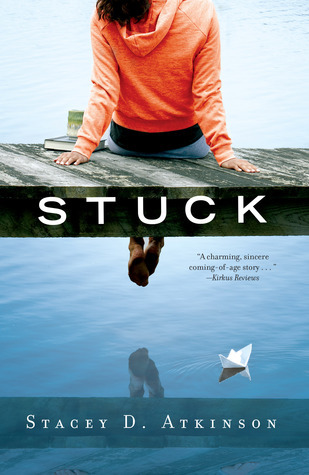 Though riddled with plot holes, I enjoyed reading Stuck and would recommend it to other readers of women’s fiction. I’m not sure if there is a sequel in the making, but Stuck feels a bit unresolved. I’d love to know where the wind blows Odette and if she finally feels she’s where she wants to be in life. I was provided an ARC by Net Galley and the publisher Mirror Image Publishing for an honest review. This book had a fresh story behind it. I have been looking for a book with a different story line, and plot; this book lived up to this expectation. I received this book as a complementary copy. I want to thank the author for going out on a limb, and writing a story that was truly unique, and not mainstream. I feel each book holds a place, and this book ranks up in place with creative story lines. Odette is the main female character, and is literally stuck in her current lifestyle. Living at home i This book had a fresh story behind it. Odette is the main female character, and is literally stuck in her current lifestyle. Living at home in a trailer, taking care of her mom (who has a bingo addiction), and trying to tend to her teenage sister Sophie; Odette is also stuck in her current job as a night shift manager of a convenience store. Odette just wants a sense of not being stuck, and one night runs into Henri a socialite on vacation. Odette makes up a whole new life, and acts in order to be around Henri, and what he has to offer in life (A nice boat, and luxuries she has never experienced). She also stumbles upon a man in a small boat out in the water literally skinny dipping every morning. She watches this man every morning after work till they finally meet. This mans name is Ben, and with Ben, Odette can be herself. This is where the storyline truly picks up, and I was chewing on my nails just wondering when it was all going to crumble apart, and how....let me tell you I did not see it come crashing down the way it did, and the story truly took off at this point in the book. Odette finally decides to take control of her life, and do what she feels called to do. I am not a book spoiler, and I must say that it's very hard not to squeal about the ending of this book, but I will say it is an ending that has potential for another book, or an ending that will allow your imagination to soar! Odette is twenty-three, living at home with her mother and younger sister, working at the local convenience store where she has been since high school and just rolling along with life. She finally realizes that she is restless,she is Stuck, that this isn't what she wants out of life, that she wants something more, but she has no idea what she wants or how to go about it. This is the summer she will meet Henri, a rich kid from the yacht club and Ben a research scient Reviewed for Readers Favorite. Odette is twenty-three, living at home with her mother and younger sister, working at the local convenience store where she has been since high school and just rolling along with life. She finally realizes that she is restless,she is Stuck, that this isn't what she wants out of life, that she wants something more, but she has no idea what she wants or how to go about it. This is the summer she will meet Henri, a rich kid from the yacht club and Ben a research scientist in the area on a project. Henri introduces her to sailing, but she keeps information about he life from him which leads to trouble. Ben knows all about her, in fact he understands her better than she understands herself sometimes. Stacey D. Atkinson gives us a story of growing up in a small town, and breaking free. Finding out what you want for yourself and going for it. This is a coming-of-age story of “a confused, minimum wage clerk [just] trying to find herself”(Atkinson, pg.171). The main character, Odette, is a twenty three year old woman who is stuck living in a small town, tired of her boring, predictable life. However, during the summer she comes across the son of rich business man visiting for vacation and a mysterious man who has an unusual habit of skinny dipping, in the ocean, at sunrise. Much like the character that shares her name, Odette from Swan Lake, she carefully balances two lives. A life she fabricated and her normal life of struggling with: an absent father, a gambling-addicted mother, and a group of Jeremy Kyle worthy coworkers. Atkinson shines at creating dimensional secondary characters that are realistic and bring the story to life. I really connected with this story. Although, it did start slow, it quickly picked up and ran off without stopping. The main character...(To read the rest of the review please read my blog posted below). Odette is a small-town girl that dreams of so much more than her new promotion as night manager of a convenience store. She also looks after her rebellious 15 year-old sister and incredibly selfish mother. Only after meeting some new people does she see that her life can be so much more. I identified, almost painfully at times, with Odette. It was really affirming that she tries to rise above her circumstances. On the other side, I didn't enjoy that she lies about who she really is in order to im Odette is a small-town girl that dreams of so much more than her new promotion as night manager of a convenience store. She also looks after her rebellious 15 year-old sister and incredibly selfish mother. Only after meeting some new people does she see that her life can be so much more. I identified, almost painfully at times, with Odette. It was really affirming that she tries to rise above her circumstances. On the other side, I didn't enjoy that she lies about who she really is in order to impress a rich sailor that shows interest in her. The author did a great job of describing the village where Odette lives on the coast. It was really easy to slip into the setting. I really only have one fault with the book, and that would be the use of French in conversation. I don't speak French, but got the gist of what they were saying. This is a story about a girl stuck in a rut. She meets two guys during the summer who are just passing through. She doesn't realize it at first but they both make an impression on her. They make her want to be more. I thought the story was a little slow moving. There was a lot of introduction and I felt like I needed a little bit more action in the first part of this book. I did enjoy the writing style. The author mixes French phrases in with English, it helped me to practice the little French I This is a story about a girl stuck in a rut. She meets two guys during the summer who are just passing through. She doesn't realize it at first but they both make an impression on her. They make her want to be more. I thought the story was a little slow moving. There was a lot of introduction and I felt like I needed a little bit more action in the first part of this book. I did enjoy the writing style. The author mixes French phrases in with English, it helped me to practice the little French I learned in high school and college. Even though I did enjoy the story I didn't feel invested in the characters and I felt like there needed to be more romance. Other than that it was nice to read something that was a little different from many of the other stories that I read. I was lucky enough to win this book during a Goodreads giveaway. Even though this wasn't my type of book, I enjoyed it. I read books of all genres and types, because every book has something you can learn from the authors voice. It was a nice change of page from heavier, longer reads. It really is a quick read in comparison. The characters felt like people I could relate with, and felt real, like they could have been fellow Canadians I've met or grew up with. (Tim Hortons was mentioned, obviously. I was lucky enough to win this book during a Goodreads giveaway. The characters felt like people I could relate with, and felt real, like they could have been fellow Canadians I've met or grew up with. (Tim Hortons was mentioned, obviously.) It is obvious that Stacey put effort into conceptualizing the characters and the depth to which they appear. This book is both raw and endearing at the same time. The title of the book so perfectly describes the main character as "stuck" that I can't imagine any other way to describe her situation. She is wedged in a life that she just can't get out of, and the author weaves a story with her that many, many of us can relate to. I highly recommend this book to anyone who wants a genuine taste of what life on the East Coast is like. And to all people who are at a place in their life where they, too, feel This book is both raw and endearing at the same time. The title of the book so perfectly describes the main character as "stuck" that I can't imagine any other way to describe her situation. She is wedged in a life that she just can't get out of, and the author weaves a story with her that many, many of us can relate to. As someone who also grew up in a small town, I found the read of this book to be very captivating, and one upon which I could personally relate to. Growing up I always wondered whether I would be a traveller or be stuck in one place for the rest of my life. As it turned out, I did travel, followed my now husband, have a great life, but still like to go home....the place where my roots are. As a debut book, it's a fantastic read and one that I highly recommend. An excellent first novel. I hope to read more by this author. Loved the Shediac-area New Brunswick setting! Wonderful coming-of-age story about a girl in small town maritime Canada. The setting takes place in a small fishing village in Canada. The authors words make it come alive in your mind. You can imagine the sand on the beach, the ocean breeze and the shops in the village. There are a few words in French thrown in that I think added to the story. The main character, Odette, is 23 and feels she is stuck with her situations in life. But due to incidents during one summer, she realizes that she wants more. You can see her change into the person she wants to be, not what is expected of her. It's a great coming of age book. A slight romance, nothing overly sweet. No mystery. No suspense. Just a beautiful all around story of how we are the only ones who can bring change and good things to our life! The ending made to me want to see what happens next so I would love to see a sequel. I definitely recommend this book if you are looking for a different type of read! My favourite thing about this book was the imagery. The setting descriptions were beautiful, incredibly easy and almost addictive. They were definitely the best parts of the book for me. Sometimes books carry too many details and it makes them deadly. Stories can slow and get boring, but somehow this book's description of the water, the beach, each boat and the marina were so suitable to the story. For someone who has never been to the East Coast of Canada, I loved seeing that part of the countr My favourite thing about this book was the imagery. The setting descriptions were beautiful, incredibly easy and almost addictive. They were definitely the best parts of the book for me. Sometimes books carry too many details and it makes them deadly. Stories can slow and get boring, but somehow this book's description of the water, the beach, each boat and the marina were so suitable to the story. For someone who has never been to the East Coast of Canada, I loved seeing that part of the country through the eyes of an author who is considered a "local". This story carries a precious appreciation for that side of Canada and I loved it. In terms of plot, this book is slow moving and can at times be uneventful but the writing isn't boring. I was intrigued the entire time. I'd say that there were one too many clothing descriptions of characters, but aside from that everything was pretty relevant and suited the story beautifully. DNF - quit at 40%. I just didn't care about the main character and had no interest in finishing. The pace was slower than slow and there was nothing that held my attention enough to make me plough through to the end. Not for me I guess. Thanks to Smith Publicity -- Mirror Image Publishing for letting me read this book in exchange for an honest, unbiased review. DNF at 30%. I didn't like the main character. I couldn't connect with the story. It just wasn't for me. set in Shediac NB where i was raised..... really enjoyed reading this fiction. I'm a freelance writer and editor based in Ottawa, Canada. In 2012, I started Mirror Image Publishing and then self-published my first book. STUCK is a coming-of age story about a young woman growing up in coastal New Brunswick. In May 2016, I published my second novel, LETTERS FROM LABRADOR, which tells the story of a young British midwife working in the beautiful yet unpredictable northern coast I'm a freelance writer and editor based in Ottawa, Canada. In May 2016, I published my second novel, LETTERS FROM LABRADOR, which tells the story of a young British midwife working in the beautiful yet unpredictable northern coast of Labrador, Newfoundland.